The rapid pace with which the technological innovations have swept the world oft leaves one with a feeling of amazement. Just a few years back most of the pictures were taken on a film roll and were printed to be kept for posterity. With the advent of digital cameras with high resolution all this changed for ever and the Moore's Law continues to be defy the sensibilities at a pace never before to pack more power and punch in every domain including the world of photography. With a surge in the number of smart phones across the country, clicking high quality digital images has become the most favorite pastime. Cutting the barriers of age, from clicking of selfies, promoted by none less than Prime Minister Modi , the trend of digital photography and videography continues to be a rage. The company specializes in many product ranges from different formats of prints, wall hangings, coffee books, magnetic frames and much more. Canvera has partnered with the giant, HP which strive for consumer satisfaction with printing solutions,evolved to meet the needs of modern day printing environment with their Indigo Digital Press. Following a brief address by the team of Canvera and HP leadership, the audience comprising of media and bloggers were introduced to experience the products and an opportunity to order the products of their choice using the ' Online Ordering Tool' on internet. The interactive tool was found to be very user friendly as with a little assistance from the team I was able to order desktop calendar and blown up pictures from my collections at the site itself! The options of online editing, enhancing the picture quality, rearranging them, choosing size, square,portrait or landscape, selection of paper quality for printing viz matt, glossy or velvet finishes makes it a very versatile and powerful tool. The prices are very affordable starting from as low as Rs 10/- per print to all the way up to Rs 7000/- including accessories. 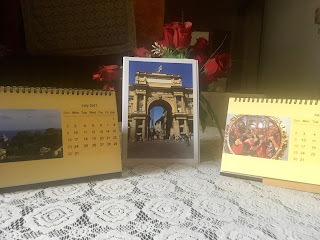 As I write this post my Online order that was taken from the venue of the meeting, the courier service has delivered my lovely pictures and calendars ordered on them. The high level of customer satisfaction with excellent product and timely delivery will make Canvera an ideal choice for those looking forward to preserve their memories of happy events in a stylish yet affordable manner . PS A grateful thanks to Canvera for the beautiful Calendars and Pictures designed by self. It was nice to learn about Canvera. Very true, Divya. Such services are a great help.